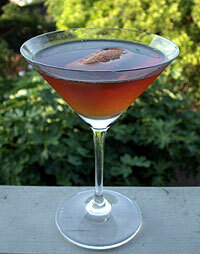 1/4 ounce Amer Picon (Torani Amer). Combine with cracked ice in a shaker or mixing glass. Stir for no less than 30 seconds, then strain into a cocktail glass. Express the oil from a lemon twist onto the surface of the drink and garnish with the twist. This is a really good drink. If you’re serious about cocktails, I once again highly recommend picking up a bottle or two of Torani Amer. 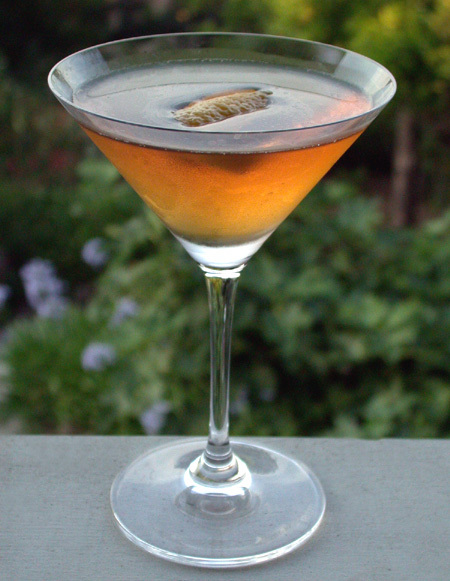 It’s a wonderful product, and in its recent reformulation works well in cocktails that call for Amer Picon. It’s not exactly the same as the Picon of old was, but it’s close enough (and it it’s close enough for all those California Basques for their Picon Punch, it’s close enough for me). Heavens, I’ve got three cocktails of the day backed up. Ah well, it was a busy week last week, what with hectic days at the day job, the radio show and having to finish up the liner notes at the end of the week. I did have time for a few libations, but not much for anything else. 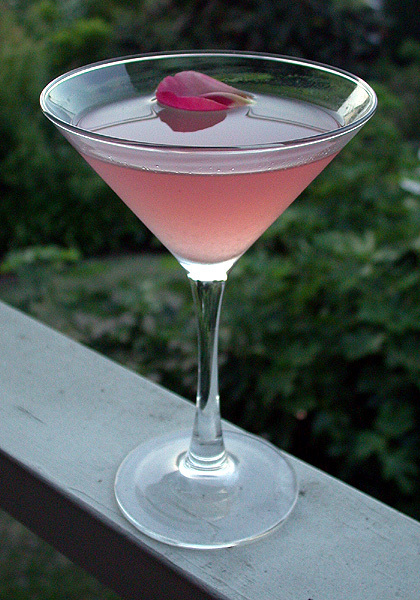 We had this one of the evening of Bloomsday, chosen solely for the syllable “Blooms” in its name and not because it has a single thing to do with Ireland, James Joyce or Leo Bloom; for all I know, it could be named after J. K. Rowling’s publisher (I’ll have to ask Robert sometime). Speaking of whom, this is a DrinkBoy original from 2003. Licor 43 (or “Cuarenta y Tres”) is from Spain, a rather sweet liqueur with a citrus-vanilla flavor and a supposedly thousand-year-old recipe of fruit juices, herbs, spices and vanilla. Yesterday was Wes’ turn, and once again he came up with a classic that neither of us had ever gotten around to trying. This is a wonderful old chestnut, and back in the day it even called for its own glass, the Delmonico glass. 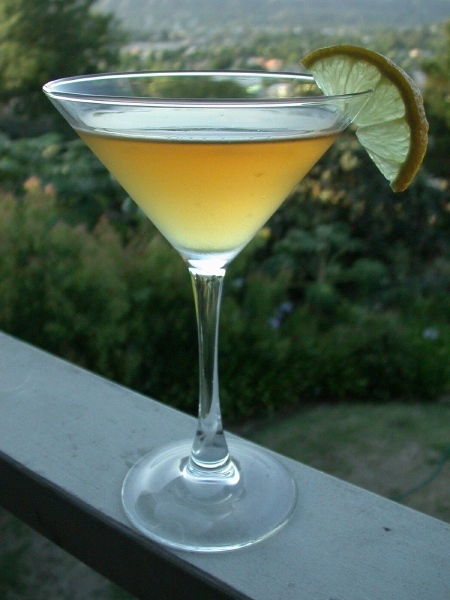 They’re rare as dodo’s teeth nowadays, but a whiskey sour glass is pretty much the same thing. We didn’t have either, actually … a cocktail glass had to suffice. The combination of the two main base spirits might sound unlikely at first, but it was really delightful. Make sure you get a nice lemon twist with lots of oil in the skin, and express that oil onto the surface of the drink when you twist — that flavor component is important. 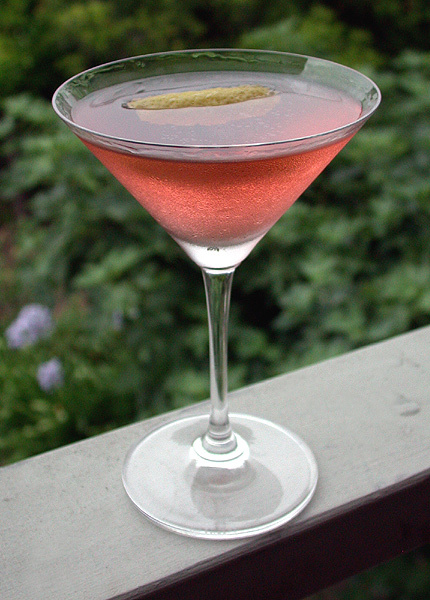 This evening (after a nine-hour day of home improvement shopping and clearing crap out of the garage) we made Dave Wondrich’s recent recommendation, the 1920s-era Rose cocktail, as featured in last week’s “Cocktailian” article. Oh my. It’s exquisite. You simply must try it. We find this drink to be far superior when you use raspberry syrup made by either Smuckers or Knott’s Berry Farm. We like the Torani product, but it’s blown away by the jellymakers’ products. 2 ounces Noilly Prat dry vermouth. 1 teaspoon raspberry syrup (or red currant syrup if you can find it). Combine with cracked ice in a shaker or mixing glass. Stir for no less than 30 seconds. Strain into a cocktail glass. No garnish specified, although I’d use a washed organic rose petal. 2-1/2 ounces Cognac (or other brandy). Combine with cracked ice in a shaker or mixing glass. Stir for no less than 30 seconds. Garnish with half a lemon wheel. If you’re anything like me (and I have what I consider to be a rather high tolerance for spirits), you’ll be rather well-buzzed after just one of these. Faites attention. If you’re anything like me, you’ll also wonder what this might have tasted like with the original Kina Lillet, less flowery and more bitter before Lillet changed the formula i the 1970s. Try adding a tiny pinch (maybe 1/16 of a teaspoon) of quinine powder to the mixing glass before you stir.